It’s time to go behind the blog with another blogger! Kimberley Linkletter is a fellow homeschooling blogger. Here, she shares how she started writing at Vintage Blue Suitcase, her favourite things about blogging, and her tips for other bloggers. TKM: First, tell us a bit about yourself. TKM: When and why did you start Vintage Blue Suitcase? Kimberley: I began blogging originally for a communications class I was taking at the university. After the class I stepped away from my blog for a bit until some of my friends and family members told me they were missing my weekly posts. After participating in a couple of blog challenges and retiring from my job as a political assistant, I decided to begin a new blog focusing on family travel and our homeschooling adventures. Kimberley: My blog name, Vintage Blue Suitcase, was inspired by the suitcases my mom had for her honeymoon. I loved those suitcases and used them for several years until they finally gave out. I managed to find another set (that are pictured on my blog) that I continue to use on our travels. Kimberley: Up until now, I’ve been posting as I have something of interest to write about but I’m trying to become more disciplined and keep to a schedule. I’m going through an update on Vintage Blue Suitcase right now, switching from Blogger to WordPress and redesigning it to organize my posts a bit more by topic, rather than all in one main stream. TKM: What is your favourite part of blogging? Kimberley: My favourite part of blogging is feeling like I am speaking with my readers. I love to share stories of our adventures and, hopefully, help others learn about places they might enjoy visiting with their own families. I also enjoy sharing how we manage homeschooling while we travel and take advantage of learning opportunities wherever we go. I do appreciate when someone takes the time to comment or respond to a Tweet about something I’ve written. TKM: Your least favourite part? Kimberley: My least favourite part is making myself sit down in front of my computer and typing it all out. I have a much easier time getting my words down with pencil and paper and have several notebooks filled with ideas for blog posts and stories that I never manage to complete. Kimberley: My advice for other bloggers, relax and don’t stress over using exactly the right word or phrase, be yourself and let your own personality come through. The blogs I enjoy reading the most are the ones where I feel connected to the writer, almost as though we are having a conversation at our kitchen table. Kimberley: It’s tough for me to decide on which is my favourite social media platform. 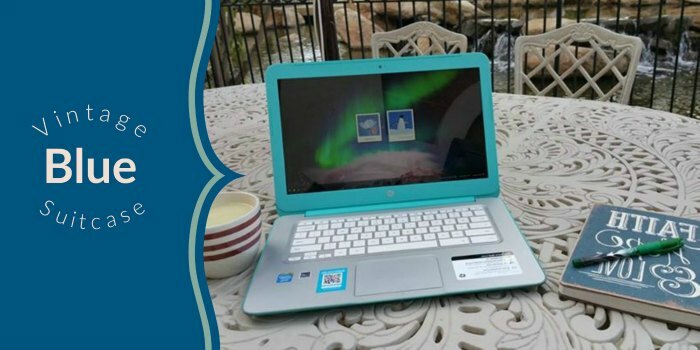 I use Twitter a lot and love participating in Twitter chats about travel but I also enjoy Facebook where I connect with other homeschooling families daily. I also find I use Facebook to keep in touch with family and friends who don’t live nearby. I’ve begun posting on Instagram a lot more, it’s so quick, easy and visual.